Baked Honey Sesame Chicken recipe is better than Chinese take-out and is perfect when you want great tasting Chinese food without all of the fat from the deep frying! Open, sesame! I love love LOVE Chinese food (or Asian food of any type, really). When I can make it at home and have it taste just as good as it does out at a restaurant then I call that a win. 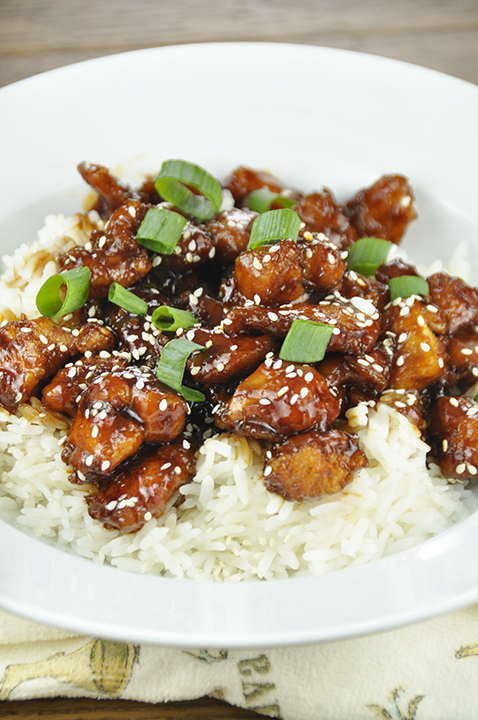 This Baked Honey Sesame Chicken is amazing and you will just love it! Can we call it “skinny sesame chicken”? Seems like a bit of an overstatement, I know, but it’s definitely a lot healthier than frying. I hope you are all having a great July so far. I can’t believe this month (my favorite month of all time) is already halfway over. Having a newborn baby sure makes time fly by. The only hours that seem to drag on and on are currently the hours between 3 a.m. and 8 a.m because that’s when Eliza thinks it’s time to party! She really is a good baby and I have to say her sleeping is overall getting a lot better. She has the occasional rough night every few nights or so, but what newborn doesn’t? I’m learning her ways and her habits and even what her cries mean. Life is getting a little easier and I’m starting to feel a little less crazy. I mean, I’ll always be crazy, but less is better. I actually don’t even own a deep fryer because frying food scares me. Weird, right? I fried some spring rolls one time and the oil spit and splattered everywhere and I was literally screaming when it happened. I swore never again would I fry anything! I know I am missing out on a lot of good food that way (hello, doughnuts) but I look at it as I’m saving myself a lot of calories and fat. 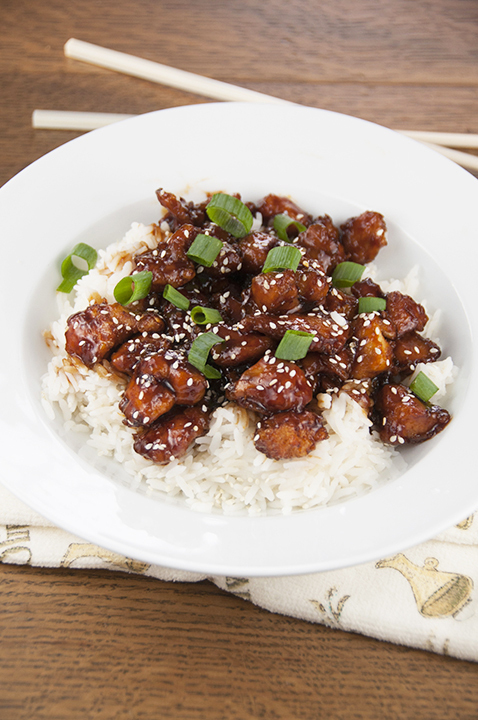 This sesame chicken has a slightly sweet sauce that I just adore. It reminds of the sesame chicken at P.F. Changs that we all know and love. Yes, I’m the person at a Chinese restaurant who orders honey sesame chicken or sweet and sour chicken every single time because I at least know it’s a safe option! Sometimes I get a little crazy and order Cashew Chicken (I linked to my homemade version) Likewise, I never order anything besides Pad Thai at a Thai restaurant. I’m a creature of habit…totally. 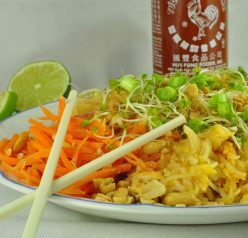 You can check out my homemade recipe for Chicken Pad Thai. 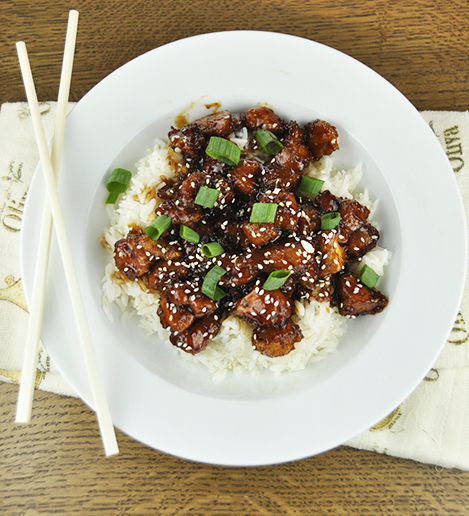 I hope this Baked Honey Sesame Chicken recipe satisfies your Chinese food cravings – I know it did for me! I also have my sights on these Chinese chicken spring rolls. Also, I’m loving this gluten free Chinese chicken salad. Don’t be intimidated to make Chinese food at home ever again. You got this! Preheat oven to 350 degrees. 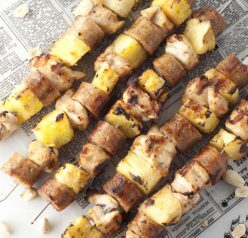 Cut up chicken breasts into bite-sized pieces and season with salt and pepper. Place cornstarch in one bowl and slightly beaten eggs in another bowl. Dredge chicken into cornstarch; coat in egg mixture after that. Heat canola oil in a large skillet over medium-high heat and cook chicken. Transfer the chicken to a large (I used a 9 x 13) lightly greased glass baking dish. In another mixing bowl, combine honey, soy sauce, ketchup, brown sugar, rice wine vinegar, sesame oil, minced garlic, and 1 tbsp cornstarch to make the sauce for the chicken. Pour sauce over chicken and bake for out 40 minutes or until chicken is done, stirring every 15 minutes or so. Serve it over rice with a side of steamed veggies! Oooh, I love that this is baked! And I agree that Asian food is the best!! I can’t believe you can make this great recipe and bake it. Sesame Chicken is my favorite Chinese dish! I LOVE these flavors! Such an easy dinner recipe too. YUM. Will try – sounds delicious. 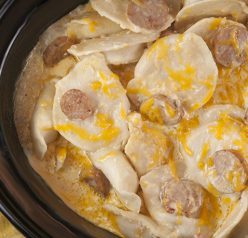 One question – fully cook in frying pan ? Or just brown? Then cook in oven for 49 minutes? Just brown it in the pan. Enjoy!